A friend once told me that he thinks that the reason why we are so impressed with the Titanic, is that unconsciously we recognise that the “unsinkable ship” is a metaphor for our ego. Many people live their lives as if their body is “unsinkable” and as if they will live forever. 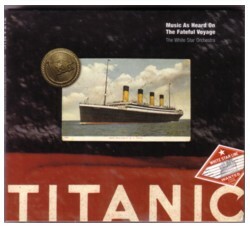 Ian Whitcomb was the man behind this Titanic CD. White Star Line was the name of the company that owned the Titanic, and her twin sister, the Olympic, who also sank. The original White Star Orchestra was led by Wallace Harley and since there is a lot of documentation of how and what the band played, Ian Whitcomb has probably made a fair reproduction of the music played on that fateful voyage. It was not meant to drive people wild; the music was for ballroom dancing and filling up the spaces in between conversations. It is not what I prefer to listen to. 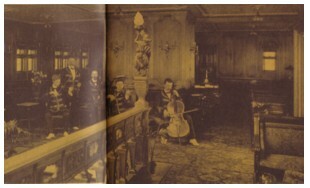 But the idea, to reproduce the music played on the Titanic, is fascinating. The booklet that is with the CD is a labour of love: beautiful artwork, great stories, good documentation, I wish all my CD’s were made like this one. Strange enough there is no recording of Autumn on the CD, and because I don’t there is much audience for a ballroom tune, I choose the recitation by Ian Whitcomb of a poem, The convergence of the twain (lines on the loss of the Titanic) , written by Thomas Hardy.